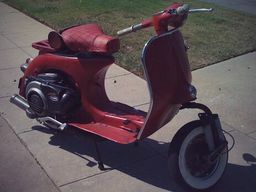 Thought it'd be nice to have a Primavera/Sprint focused thread for us to share our experiences, upgrades, setups, wishlists and tips for all Vespa Primavera/Sprint Lovers. The longest Ive ridden it has been 100mi round trip on the stock rollers, havent had the chance to go on a WOT trip with my current setup. I have a Sprint 125 and wanted to make it better for two up riding. It currently does the job well and we love touring the Italian countryside on it but wondered if there are any mods to make it even better. Yep 12.5g seems to be the popular safe setup. Well I was able to take advantage of late night empty roads just to realize that my roller weight reduction to 12.5gr has increased acceleration but lost top speed. My 0-90km/h is stronger and faster, upwards gets really slow, and Im maxing out at 108km/h after pretty much 1/2 mile WOT. Before this setup change i had top speeds of 115km/h on flats WOT (considerably faster from 100-115) but had very little torque down low. So I now believe there is a trade-off. I did gain low to mid range at the cost of high range. Looking forward for tips, experiences and advice. I guess it needed some breaking in.. I've been able to hit 120km/h with ease on straight lines.. i went for a 100kms ride on PanAmerican Hwy and it was a blast. Put the Malossi 190 kit on it.